A stay in İstanbul is not complete without a traditional and unforgettable boat excursion up the Bosphorus, that winding strait that separates Europe and Asia. Its shores offer a delightful mixture of past and present, grand splendor and simple beauty. Modern hotels stand next to yalı (shore-front wooden villas), marble palaces abut rustic stone fortresses, and elegant compounds neighbor small fishing villages. The best way to see the Bosphorus is to board one of the passenger boats that regularly zigzag along the shores. You embark at Eminönü and stop alternately on the Asian and European sides of the strait. The round-trip excursion, very reasonably priced, takes about six hours. If you wish a private voyage, there are agencies that specialize in organizing day or night mini-cruises. During the journey you pass the magnificent Dolmabahçe Palace; farther along rise the green parks and imperial pavilions of the Yıldız Palace. On the coastal edge of the parks stands the Çırağan Palace, refurbished in 1874 by Sultan Abdülaziz, and now restored as a grand hotel. For 300 meters along the Bosphorus shore its ornate marble facades reflect the swiftly moving water. At Ortaköy, the next stop, artists gather every Sunday to exhibit their works in a streetside gallery. The variety of people creates a lively scene. Sample a tasty morsel from one of the street vendors. In Ortaköy, there is a church, a mosque and a synagogue that have existed side by side for hundreds of years - a tribute to Turkish tolerance at the grass roots level. Overshadowing İstanbul's traditional architecture is one of the world's largest suspension bridges, the Bosphorus Bridge, linking Europe and Asia. The beautiful Beylerbeyi Palace lies just past the bridge on the Asian side. Behind the palace rises Çamlıca Hill, the highest point in İstanbul. You can also drive here to admire a magnificent panorama of İstanbul as well as the beautiful landscaped gardens. On the opposite shore, the wooden Ottoman villas of Arnavutköy create a contrast with the luxurious modern apartments of neighboring Bebek. A few kilometers farther along stand the fortresses of Rumeli Hisarı and Anadolu Hisarı facing each other across the straits like sentries guarding the city. The Göksu Palace, sometimes known as Kücüksü Palace graces the Asian shore next to the Anadolu Hisarı. 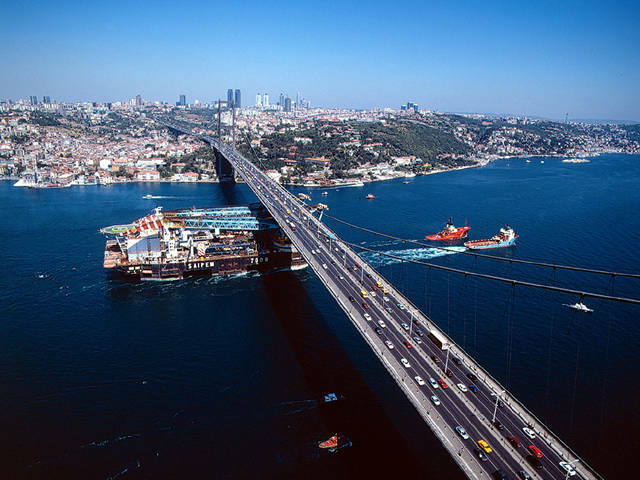 The second link between the two continents, is the Fatih Sultan Mehmet Bridge straddles the waterway just past these two fortresses. 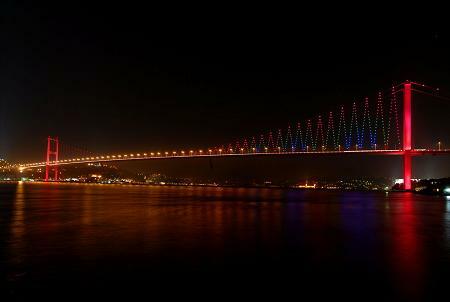 From Duatepe Hill, on the European side, you can admire the magnificent panorama of the bridge and the Bosphorus. Below Duatepe, the beautiful Emirgan Park bursts with color when its tulips bloom in the spring. On the Asian shore is Kanlıca, a fishing village that is now a favored suburb for wealthy İstanbulites. Crowds gather in the restaurants and cafes along its shores to sample its famous yogurt. Shortly after Kanlıca and Çubuklu is the Beykoz Korusu (İbrahim Paşa Woods), a popular retreat. In the cafes and restaurants there you can enjoy the delightful scenery and clear, fresh air. Back on the European side, at Tarabya Bay, yachts seem to dance at their moorings. The coastal road bustles with taverns and fish restaurants from Tarabya to the charming suburbs of Sarıyer and Büyükdere. Sarıyer has one of the largest fish markets in İstanbul and is also famous for its delicious varieties of milk puddings and börek (pastries). On past Sarıyer, the narrow strait widens and opens into the Black Sea.